Week six of the plan was always going to be a big one – make or break. The first indication of whether I'd been wasting my time training with heart rate or all this hard work was going to pay off. For the uninitiated, we've been training with heart rate tech to find out if these flashing green lights we've been strapping to our wrist can really turn us into better, faster runners or whether it's snake oil for elite pros only. 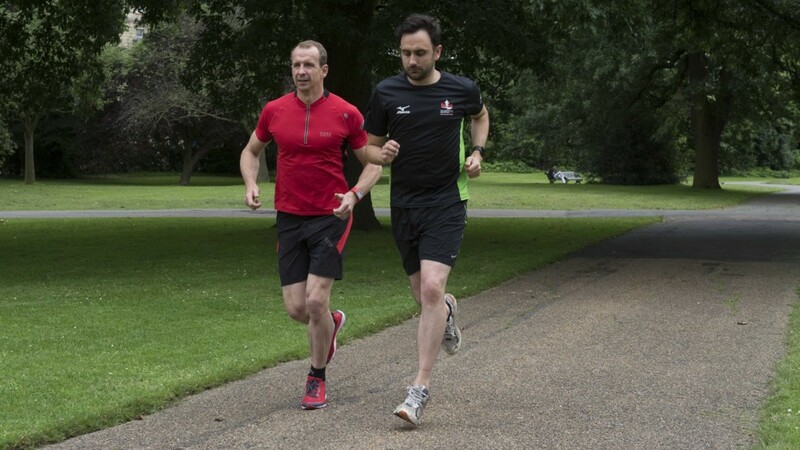 We've enlisted Fitbit ambassador and former Olympian Greg Whyte to help us build a plan and interpret the results. And week six was always the big week for Greg. The reason is that elite athletes work in MISO cycles – timescales that act as micro goals within the bigger picture. For example, in a four-year Olympic cycle, an Olympian's MISO cycle may last an entire winter. My MISO cycle was six weeks, half of my training programme. The idea is to perform a run under the same conditions at the beginning and end of that cycle and look for an improvement. In this instance, we were comparing to a 45 minute run at LT intensity, which we'd worked out to be 165bpm. The difference we were looking for was the pace of that run at a similar intensity. If you haven't got the foggiest what we're talking about, go back to week one. With this in mind, week six was a big milestone. But at the end of last week you might remember I was complaining about tiredness. An ill-fated 45 minute run at LT – straight after I'd torched over three minutes off my 10K PB - made me worry about whether I was going backwards. And two days later, it happened again. Another 45 min LT run had my heart rate rocketing way above my threshold peaking at 175bpm, despite plodding at a pedestrian 9:40 min/mile and avoiding hills. It wasn't normal and deeply worrying. Over a six-week MISO cycle, this would mean I'd actually deteriorated. Even worse, I spent Thursday with a throbbing in my hip where I'd suffered an injury before. I took three days off, which meant I'd have to scale back the week's schedule. That left another 45 minute LT run and then a 90 minute LT run, which I felt I needed. I was yet to go long. So Saturday morning I headed out again, hopeful of making this MISO cycle show some improvement. A bit of cloud cover made the heat less intense than earlier in the week. And, thank goodness, my heart rate behaved. I was able to regulate my pace, bring my heart rate down when required, which a few days earlier I wasn't able to do, and still maintain a pace of 8:43. The comparison, neatly, averaged 167bpm over both runs so the comparison was easy. In week one I ran at 9:20 and in week six I'd performed at 8:43 at the same intensity. A 37-second-per-mile improvement is the difference between running a 2:02 and 1:53 half marathon. There you have it: six weeks of training quantified via heart rate. The last run of the week was a long run. The plan from Greg was to do 90 mins at LT pace, but having run at 165bpm all week, I was up for testing myself. And my plan was to run the Reigate Half Marathon before the end of the training plan, so I felt it was time to spend a little more time at AT1 pace. So I ripped up the training plan and satisfied my need to up my pace. It wasn't a total rejection of heart rate. I aimed to keep my heart rate at 165bpm LT for the initial hill climb and early stages of the run, and then upped to 172-175bpm AT1 for the rest of the run. I averaged 167bpm with an average pace of 8:37, despite some hellish hill climbs. I held the pace over 11.5 miles of hot hill climbs and crowded city running as I navigated south London from Croydon to Brixton and back. I was officially back in the game. So what can I conclude about the run? Well, perhaps it's the most telling period of my training to date. Firstly, listening to your heart can not only help you run better – it can also tell you when not to run. The high heart rates after the speed focused week five were a clear indicator to take a break, and my body responded. And for the first time, I can quantify the changes from my training. I can think about race paces based on what I know to be true. And I can run more confidently. In the past I've finished races above my target time because I've run too conservatively. Now I can feel confident I can run at 172bpm and still carry pace into the last three miles. Heart rate has changed the way I run - I'm a convert. Now to push on with the second half of the plan and see how far I can take this.